Book reviews, Book hauls and everything book related. Absouletly amazing book. An action pakced, thrilling adventure. This book is full of jet packs, evil aliens, CHAOS secret agents and much much more. It truley is too good for words. The book is about a boy called Colt. He starts off by going to a training acadmey for upcoming CHAOS agents. Shortly after he returns his parents are murdered. Colt finds out why and, in an effort to avenge his parents, gets into more than he bargained for. Microchips in the brain that turn innocent people into savage assasins is just part of his problems. Not to mention he has to juggle school and liking a cute girl Lily. This book was completely fantastic. It was a great science fiction/fantasy and usually I'm not really into that stuff but this honestly has to be one of the best books I've ever read. The plot was amazing and had so many layers to it. The characters were easy to connect yourself to and get attached to and the writing was superb. I can say no faults with this story at all. A must buy AND a must read. Plus there is a sequel coming in Jan 2012!! 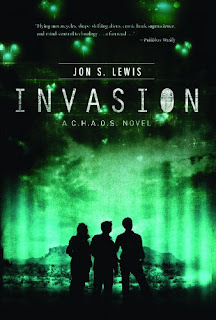 This entry was posted on Thursday, 20 January 2011 and is filed under ARC,book review,books,invasion,jon s lewis,novel. You can follow any responses to this entry through the RSS 2.0 feed. You can skip to the end and leave a response. What I've read in 2011/ 50 book challenge. 1. Harry Potter and the Deathly Hallows. 9. The betrayal of Natalie Hargrove. 11. Tangshan Tigers: The stolen Jade. If you have any questions, want me to review a certain book or want to recommend a book to me, please email me at halfbloodprincessvoiceswithin (@) hotmail (.) com. If you are an author or publisher and would like me to review your work in paperback, hardback or audio book form please contact me at the email address above. If you are a self published and/or debut author and would like me to read, review and/or promote your work please email at the address below. 1/5 -Dismal! Completely awful/ didn't finish it. Do not recommend. 2/5- Not awful but really not good. Wouldn't strongly recommend it. 3/5- Not bad, not good. Mixed feelings, could of been better. 4/5- Good book, would recommend it just missing a little thing to make it fantastic. 5/5- Excellent, must read right away. Highly recommend it. Copyright © Books with Bridget. All rights reserved.